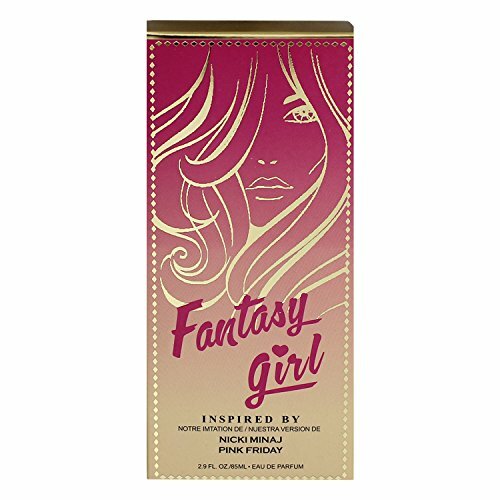 Fantasy Girl Perfume By Watermark Beauty. If you are looking for something that can make you more seductive and appealing while having dinner with your loved one, this perfume is ideal and could do wonders for you. It smells amazing and would definitely enhance your personality. Designed to make for a great gift, birthdays anniversaries, graduation, holidays or just any day to day gift giving exchange. Made by Watermark Beauty. To ensure Great customers satisfaction this product Essential Oil was manufactured in the UK. Eau De Parfume Spray Women 2.9 Fl. Oz./85 Ml. Fantasy Girl by Watermark Beauty is not associated with the maker of Pink Friday by Nicki Minaj. Inspired by Pink Friday by Nicki Minaj For Women. Packaging for this product may vary from that shown in the image above. Inspired by Pink Friday by Nicki Minaj, the all-new perfume is a real treat for those wanting to try a new, unique and outgoing fragrance. The whole new experience for Women - leave a great, positive impression with this Women's Eau De Parfum Spray by Watermark Beauty. Makes for a perfect gift for Women on their special day - Stand out and make that great first impression.